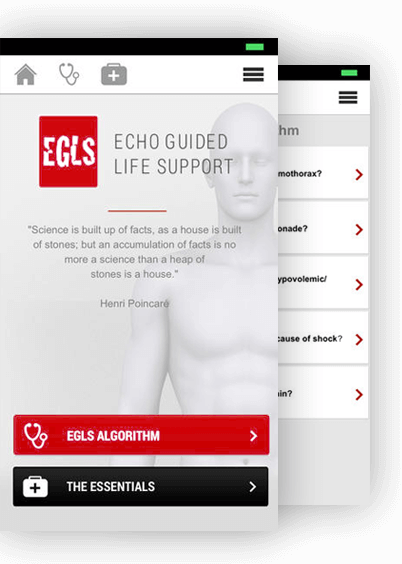 All you need to know about EGLS (Echo-Guided Life Support), but on paper. Our book covers both step-by-step image acquisition and interpretation and features anatomical illustrations, descriptions, as well as useful tips and pitfalls. Complete, thorough and interactive e-learning on ultrasound in the context of shock/resuscitation. Learn efficiently and at your own pace thanks to a well-constructed program of 6 modules, with hundreds of videos, tutorials, quizzes and more. Given in many locations worldwide, our workshops are the first step towards mastery. Participants enjoy lots of hands-on practice thanks to a machine/participant ratio of 1 : 2. If you can’t attend upcoming workshops, we will come to your shop. * The prices may be lower depending on your country. All prices are in CAD dollars. The EGLS Course is the initiative of long-time colleagues Jean-Francois Lanctôt and Maxime Valois. Their passion and core motivation is to provide their fellow practitioners with a structured approach to shock and peri-arrest patients, one that's efficient, standardized and, ultimately, that will help save lives. They have surrounded themselves with the best team of instructors to create the EGLS course. They now offer workshops worldwide that present one of the best instructor/participant ratio in the world. All the boring stuff you really need to know. Only that. Kept simple. You think you already know this ? Guess again ! The right or the left ventricle ? That is the question. I can't access the eLearning ? Who can attend the EGLS course? I did the eLearning and now I want to attend a workshop, what should I do ? Go to workshop page, or contact us if you would like workshop in your institution. Can I get a group discount ? Yes you can ! Groups of 5 get 10% discount and group of 10 get 20% discount. I bought the eLearning. How long do I have access to its awesomeness? You have 90 days to complete the eLearning.